Whether it's photographic prints, web pages or documents, printing can be seriously expensive and damaging to your wallet. But there are a few simple ways to cut printing costs and save you money. 1. Print in draft wherever possible. 2. Consider using Planet Ink Club, who use specially designed ink which will be perfectly compatible with your printer. 3. Print in Duplex where possible. 4. Keep new ink cartridges sealed until they are needed - ink will evaporate. 5. Avoid keeping ink cartridges in a hot spot. 6. Print pages in black and white where possible. 7. Re-use paper where possible. 8. Note that turning a printer on uses a small amount of ink during the head clean. 9. Ensure all settings are correct during the printing set up, For example don't use a photographic paper settings if you are printing on plain A4. 10. Refill ink cartridges as opposed to buying new ones. 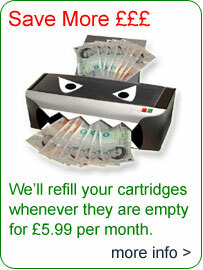 Use the economically friendly Planet Ink club who will refill your cartridges and send them back to you via post.